What is bedrock frost heave with rotation? The above photo shows joint blocks that have been lifted upward by frost heave and then rotated outward from a sloping bedrock face. The picture provides an example of bedrock frost heave with rotation. Bedrock frost heave leading to the formation of frost-heaved monoliths often consists of translation only. 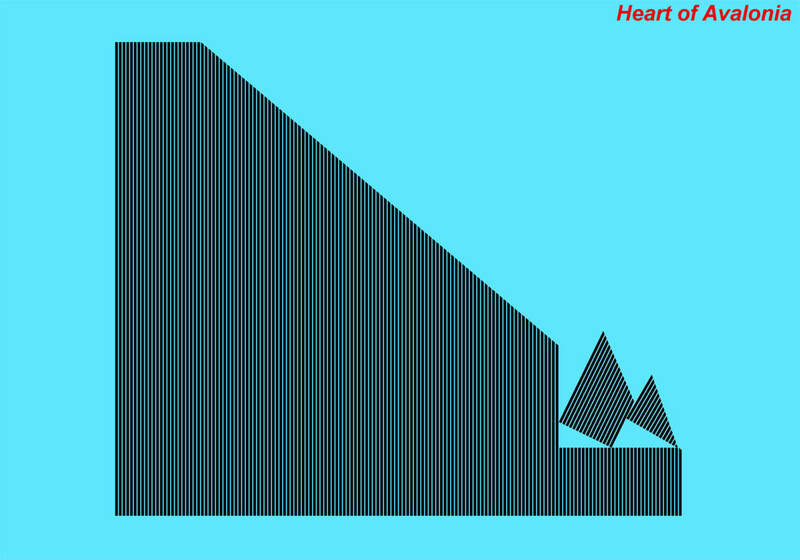 This is a one-dimensional process where rock displacement occurs along a single axis (X) of translation. In the more general case, rock displacement can include a component of rotation. Then, the process is intrinsically two-dimensional with motion occurring in an X-Y plane. It is useful to examine bedrock frost heave with rotation because rotation can reveal information about tangential ice motion at the ice-bedrock interface. The rock displacement illustrated in the figure at the left of the above diagram does not reveal information about tangential ice flow or a potential tangential ice pressure gradient. The figure on the right suggests evidence of left-to-right ice flow or of ice pressure diminishing toward the right. The joint blocks illustrated above have undergone bedrock frost heave with rotation. The rotation is suggestive of tangential ice flow occurring left-to-right across the blocks while they were being pushed upward (or after they were raised). Observations such as this can help support a deduction that the bedrock frost heave occurred in a subglacial rather than in a subaerial environment. Most instances of bedrock frost heave with rotation occur on sloping bedrock faces rather than on level ground. 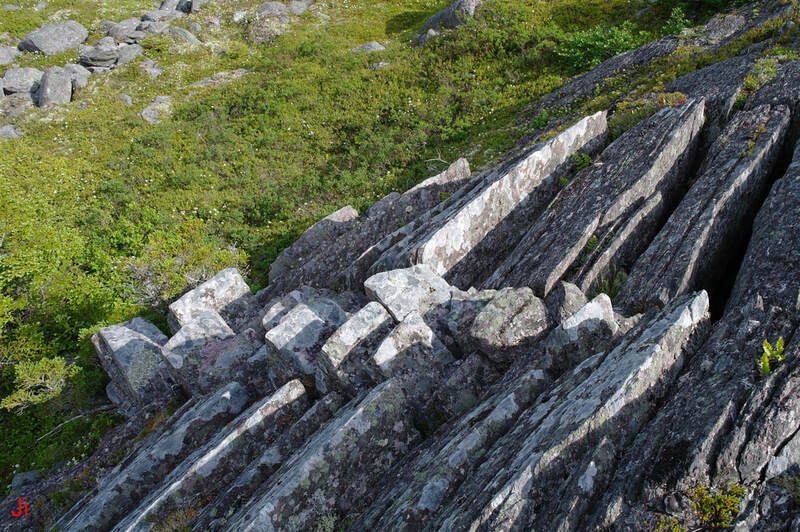 When frost heave occurs on a sloping rock face with steeply dipping bedrock foliation (a common instance on the Avalon Peninsula), rotation of the resulting fragments can be favored by geometry. On a sloped surface the resistance to movement by rotation or by translation plus rotation (right figure above) can be lower than the resistance to movement via translation only (left figure above). When bedrock frost heave with rotation occurs on a sloping bedrock face it can thus be ambiguous as to whether geometry was the sole determining factor or whether tangential ice flow also influenced the motion of the displaced blocks. Further uncertainties arise when blocks shifted purely in translation eventually settle into a tipped (rotated) orientation because confinement at the base of the blocks is insufficient to prevent settling via rotation. 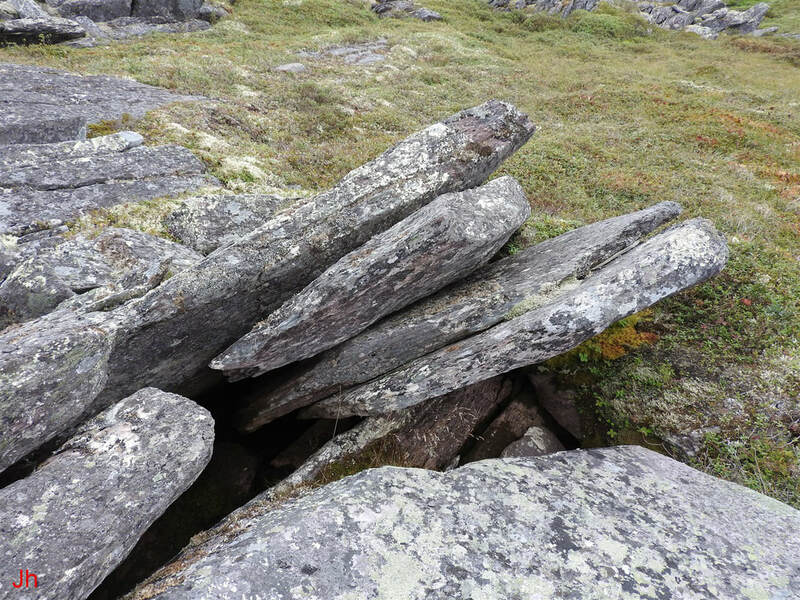 Bedrock frost heave with rotation is observed at many locations on the Avalon Peninsula of Newfoundland. Generally, locations featuring abundant frost-heaved monoliths also feature common occurrences of bedrock frost heave with rotation. Local topography characterized by numerous large or small ridges provides a particularly favorable environment where rotated frost-heaved joint blocks can be found on sloping bedrock surfaces. The above photo shows small ridges formed by the glacial erosion of sedimentary rock with bedding planes dipping at a low angle. In analogy with the preceding photo, the above diagram illustrates one of the most common arrangements leading to bedrock frost heave with rotation on sloping bedrock surfaces. The illustration above shows a detail from the upper left of the previous diagram where bedrock frost heave with rotation has occurred. 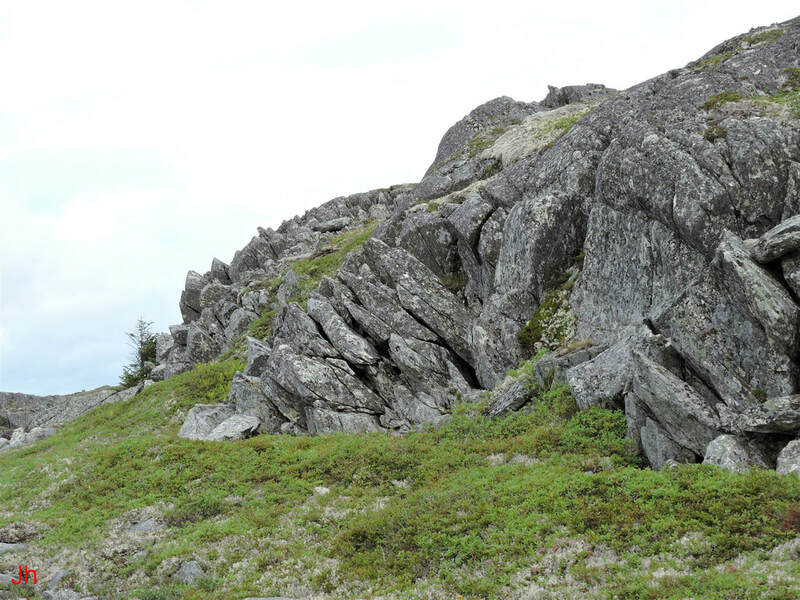 Although the illustrated configuration featuring sedimentary rock is commonly observed at various locations on the Avalon, bedrock frost heave with rotation is also frequently seen on the sides of ridges occurring in volcanic rock. Sets of cross joints can play the same role as weak sedimentary layers in facilitating ridge formation and the development of well-defined joint blocks subject to frost heave. The flow of warm-based glaciers and associated basal-slip erosion is critical in setting up inland topographies with the features illustrated above. 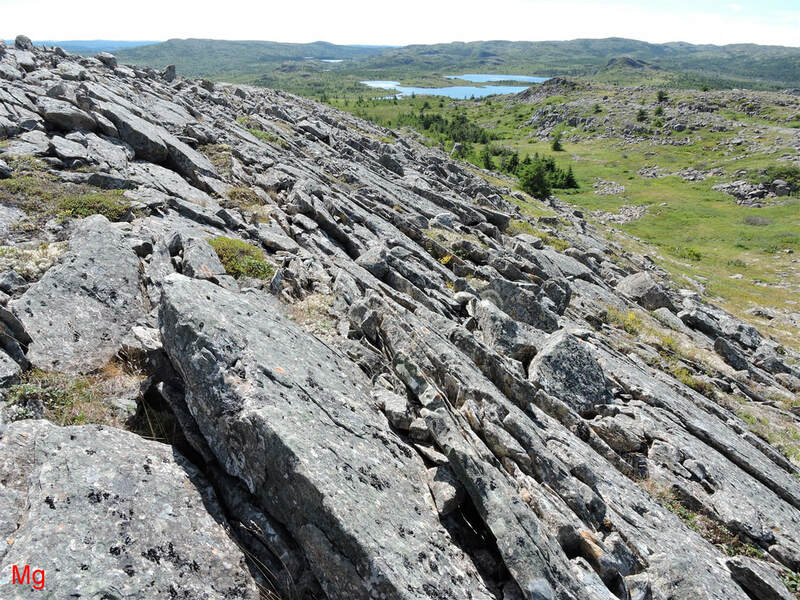 Intense basal-slip glacial erosion can cleave off large sections of bedrock, remove the resultant rock debris to distant locations, and then round and smooth the resulting bedrock surfaces. Multiple episodes of warm-based glacial ice flow with changing flow directions are typically involved. It is often difficult to interpret occurrences of bedrock frost heave with rotation that occur on sloping bedrock surfaces. Interpreting an occurrence is aided when a model can be assigned to the basic hydrogeological, glacial and thermal conditions that prevailed when the occurrence was formed. Four basic models are presented and discussed below. The model illustrated above is dependent on the assumption that a deglaciated periglacial environment existed on parts of the Avalon Peninsula during the late stages of the Wisconsin and the Younger Dryas, or during only the Younger Dryas or during only the late stages of the Younger Dryas. The areas affected by bedrock frost heave could have been nunataks within an otherwise glaciated region, or the entire Avalon region could have been deglaciated preceding or during an interval of polar desert climate conditions extending up to the commencement of the Holocene. Subaerial frost wedging is thought to account for most or all of the occurrences of bedrock frost heave seen worldwide. The underlying mechanism for rock displacement under periglacial conditions without glaciation is described in articles readily available on the internet and has been discussed previously on this website. The following discussion focuses briefly on how to justify rejection of the subaerial origination model for some instances of bedrock frost heave. By definition, the presence of thick overlying glacial ice is precluded in applying the subaerial frost wedging model. Therefore, evidence of glacial activity having occurred in close association with episodes of bedrock frost heave will warrant rejection of the subaerial frost wedging model. 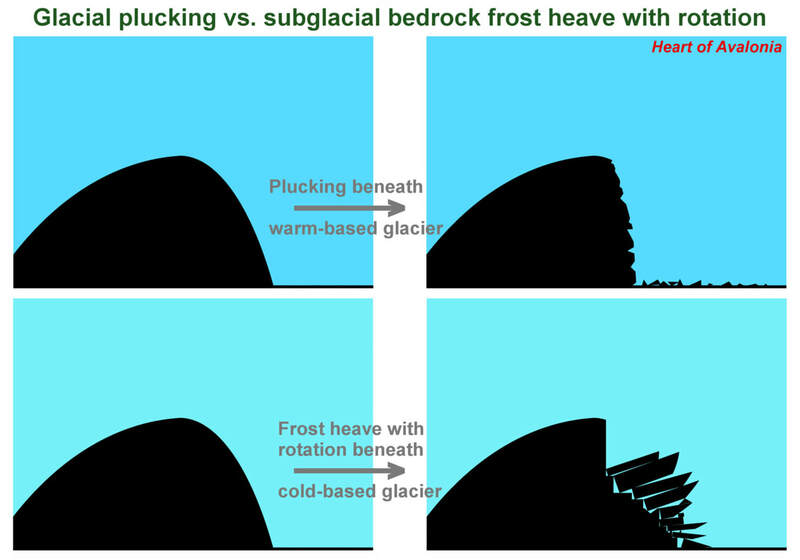 In the general case, an ice cap or glacier provides an insulating barrier sufficient to prevent significant seasonal temperature changes from reaching bedrock. A possible exception arises in the case of a "thin" glacier. If overlying glacial ice were thin (just a few meters thick), then seasonal temperature cycling could theoretically reach bedrock and allow operation of the frost wedge mechanisms normally associated with a subaerial environment. This "thin subglacial" model is difficult to discount entirely but is improbable because thin glaciation does not tend to persist for extended intervals and because wide areas of thin glaciation seem incompatible with a topography that is rugged on a scale of tens or hundreds of meters. 1) The presence of overlying glacial ice is suggested when bedrock fragments generated by frost heave activity have been shifted beyond the reach of bedrock-confined ice. For example, if a fragment is expelled from bedrock on a level or gently sloping surface and comes to rest a significant distance from the cavity left behind, then horizontal glacial ice flow is indicated. A weaker form of the same type of evidence is provided by observations of loose joint blocks occurring in a frost-heave affected area with no obvious nearby cavities or by observations of empty cavities where the originally-present joint blocks are not seen. 2) Organized "flow" patterns in frost-heaved rock fragments imply the presence of overlying moving glacial ice. A subaerial bedrock frost heave occurrence would not be expected to show correlations in the positions and orientations of multiple separated frost-heaved bedrock fragments. 3) When glacial ice overlying an area depletes entirely, erratic boulders carried in the ice sheet are deposited on the ground. 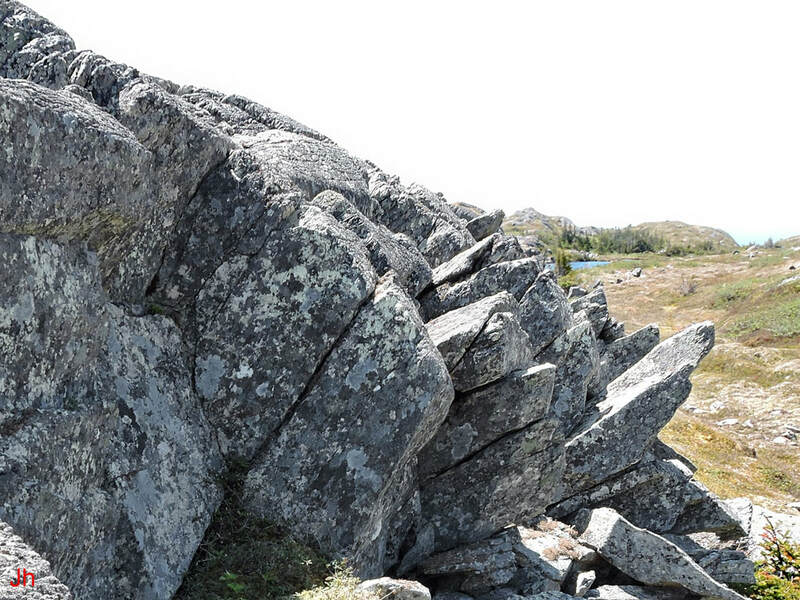 If erratics are found lying on top of bedrock frost heave features, then a question arises: Did the frost heave occur underneath the already-deposited erratics, or did the erratics descend and settle on the already-formed frost heave features? 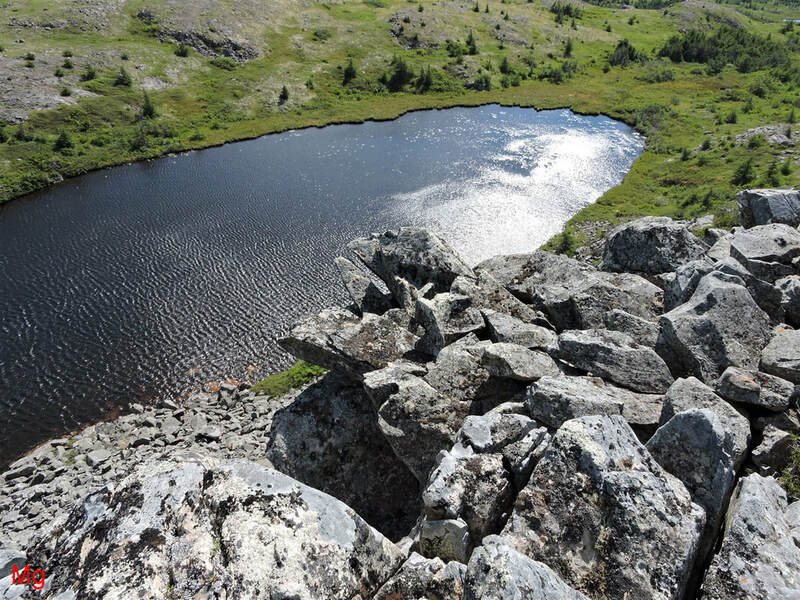 Careful examination of damage to fragile frost-heave features underlying erratic boulders can help make a determination, as can the precise pattern of contact between an erratic boulder and underlying frost-heave fragments. These two types of observations are discussed in Glacial Erratics and Bedrock Frost Heave: Event Sequencing. Another possible indication of event sequencing is found when a rounded erratic boulder is observed on a steep frost-wedged hillside. If the erratic boulder is held in its observed position by frost-heaved fragments and the boulder could not likely have rested unsupported on the slope before frost wedging occurred (it would have slid or rolled down), then the boulder was presumably deposited close to its observed location by glacial ice that departed after frost wedging had modified the slope. 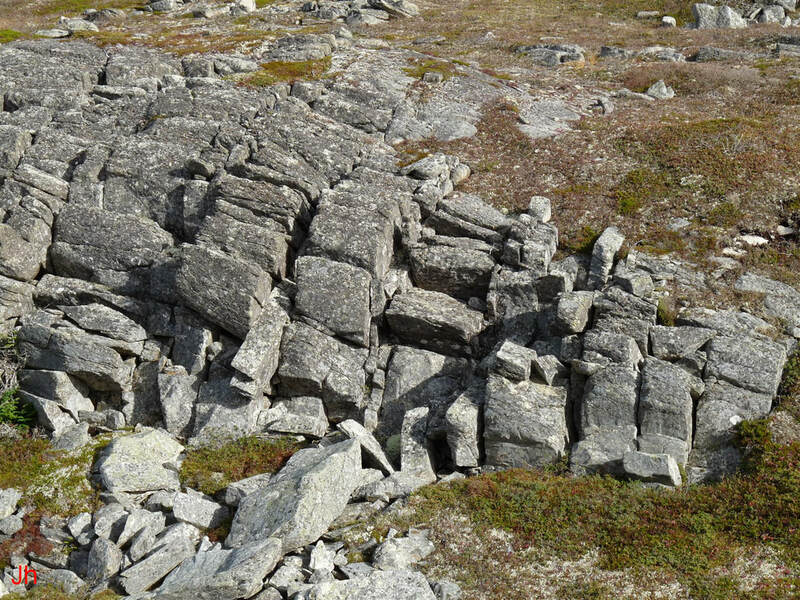 4) Large (scale of several meters) monolithic fragments of rotated frost-heaved bedrock extending outward from a sloping surface and suspended in a precarious but organized pattern suggest a subglacial origin when the size and spacing of the fragments makes confinement of meteoric ice between the blocks improbable. In this instance there remains a possibility that frost wedging via meteoric water accumulating and freezing at the bases of large blocks could lever the blocks into position. This description appears improbable because of the inherent instability of a highly cantilevered rock-fragment assembly. Frost wedging at the base of such an assembly would likely cause its collapse. 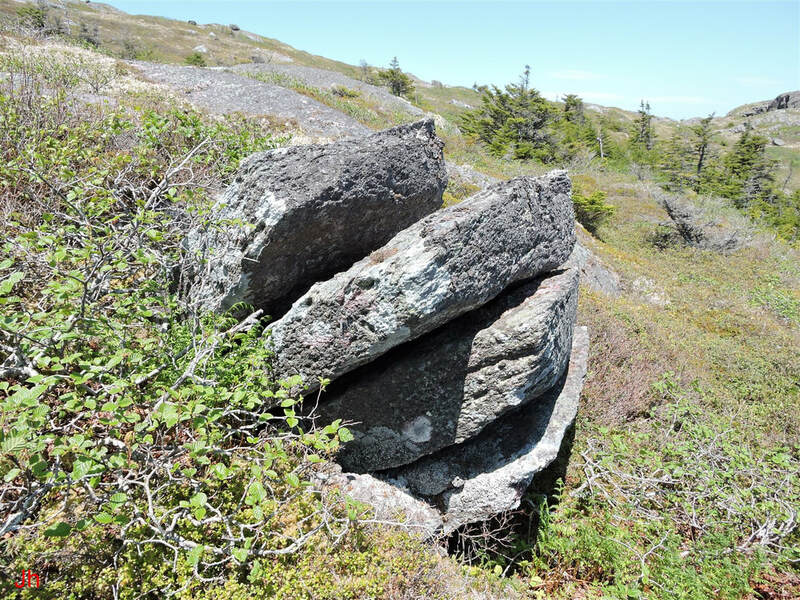 Examples of the above-listed criteria for deducing glacial ice presence have been observed (often in combination) alongside relict bedrock frost-heave occurrences at various locations on the Avalon Peninsula. It thus appears reasonable to conclude that some or all of the occurrences of bedrock frost heave and bedrock frost heave with rotation observed on the Avalon are not of subaerial origin and thus are not properly described by Model 1. Many occurrences of bedrock frost heave with rotation on sloping rock faces superficially resemble instances of glacial plucking. The conventional definition of plucking limits the process to operation beneath warm-based glaciers. Plucking by a cold-based glacier might be possible (see Technical Note 12 and Illustrative Feature 07) but the effects of cold-based glacial plucking would be indistinguishable from the effects of bedrock frost heave via the Subglacial Ice Plume model. Hence, only plucking by warm-based glaciers will be considered here. In cases where bedrock frost heave on a hillside leads to a disorganized pattern of broken and scattered rock fragments, it can be difficult to distinguish a frost-heave origin model from a plucking-origin model. The key difference between the two models lies in the assumed temperature regime of the overlying glacier, warm-based for plucking and cold-based for frost heave. The plucking model utilizes ice-pressure reduction, hence freezing point elevation, to provide the mechanism for ice accumulation in joints and voids leading to rock displacement. Models involving cold-based glaciation utilize super-cooled pore water and ice segregation to provide an ice accumulation mechanism. A warm-based glacier will tend to move much more rapidly than a cold-based glacier over similar terrain. The faster ice movement is attributable to the basal sliding mode of ice movement (basal sliding does not occur beneath cold-based glaciers) and to the more rapid creep of temperate ice versus cold ice, given similar stress. The faster movement of temperate ice would generally imply greater distances of transfer of dislodged rock fragments over a given time interval. When bedrock frost heave with rotation is observed on a hillside, it is implicit that the rotated fragments have undergone little total displacement. Otherwise, the fragments would not form a pattern recognizable as a rotated frost heave event. Thus, bedrock frost heave with rotation tends to favor adoption of a cold-based glacier model to explain the origin of the occurrence. While an event involving plucking by a warm-based glacier could theoretically terminate with very small total rock displacement, such an event could reasonably be considered uncommon. 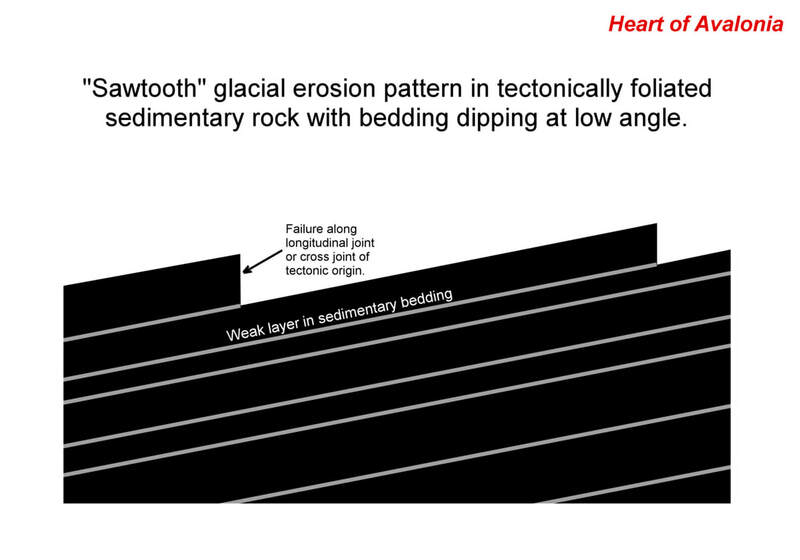 The above diagram illustrates the expected difference in rock transfer between a plucking event and a frost-heave event occurring on a sloping rock face. In the upper sketch, most of the rock affected by the plucking event is shown as absent from the site. In the lower sketch, all of the rock originally present before a frost-heave event is shown as fragmented and rotated, but still present at the site. Note also in the second sketch that the original surface of the bedrock slope can be identified on the ends of the rotated bedrock fragments. Some examples of plucking are shown in the photos below. The above photo shows the side of a hill facing the ocean, but about 1 km inland. Glacial ice flowing from further inland encountered no additional obstructions before reaching the sea after passing this hill. This topography favored ice pressure reduction, hence plucking, on the rock face shown. The broken rock at the base of the hill appears to have resulted mainly from Holocene mass wasting. The hillside illustrated above shows evidence of plucking by a warm-based glacier. Most of the rock broken from the cliff face is no longer present at the site. 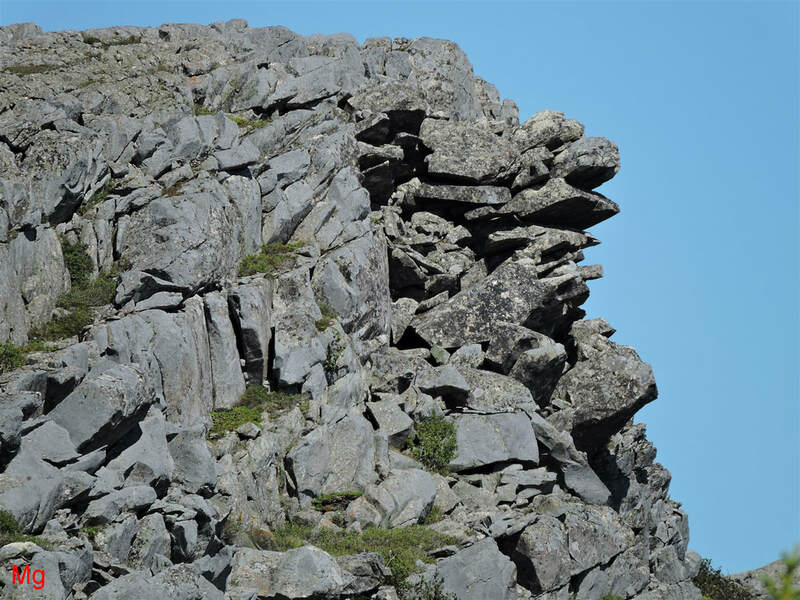 An apparently plucked inland cliff face is shown above. Note the large cavern (just above center in the frame) formed when a section of rock was displaced and transported. The photo above shows what could be a hybrid feature, demonstrating both plucking and bedrock frost heave. The feature resembles a roche moutonnee with the plucked lee side visible front, right, in the photo. 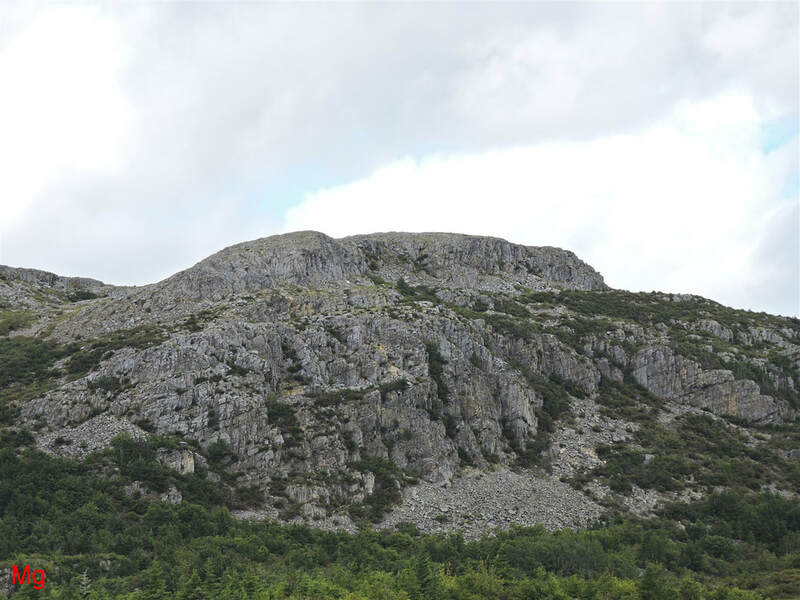 The ragged outcrop of rock at the top right of the hill might comprise frost-heaved bedrock. Two closeup views of the possible frost-heaved bedrock outcrop mentioned previously are shown above. The displaced fragments show indications of bedrock frost heave with rotation. Alternatively, the feature could represent the terminal stage of a plucking event. If the fragments were shifted (frost heaved) under cold-based glacial conditions, then the feature marks the transition from warm-based glaciation to cold-based glaciation that appears to have occurred in this region during the Younger Dryas. The surrounding area incorporates additional probable markers of a warm-based to cold-based glacial transition. The stoss side of the above-illustrated hill is shown below. Note the intense frost heave evident in the originally smoothed stoss side of the previously illustrated hill. Large frost-heaved monoliths are also present in the immediate area. These observations suggest a transition from warm-based glaciation to cold-based glaciation and then deglaciation. Within the context of this interpretation, pressurized groundwater, trapped beneath a layer of frozen bedrock, would presumably be responsible for enabling or accelerating the observed frost heave. 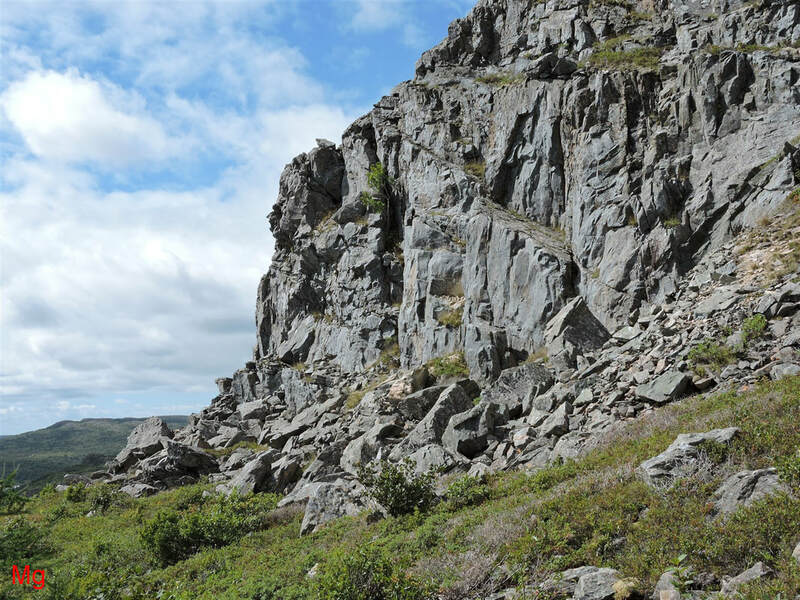 Although plucking by warm-based glaciers may have significantly affected the geomorphology of the Avalon Peninsula, not all occurrences of ice-disrupted bedrock on cliffs and hillsides can explained with this process. The two examples presented below show instances where Model 2 (warm-based glacial plucking) does not appear well suited for the interpretation of observations where bedrock frost heave with rotation is the dominant mode of rock displacement. 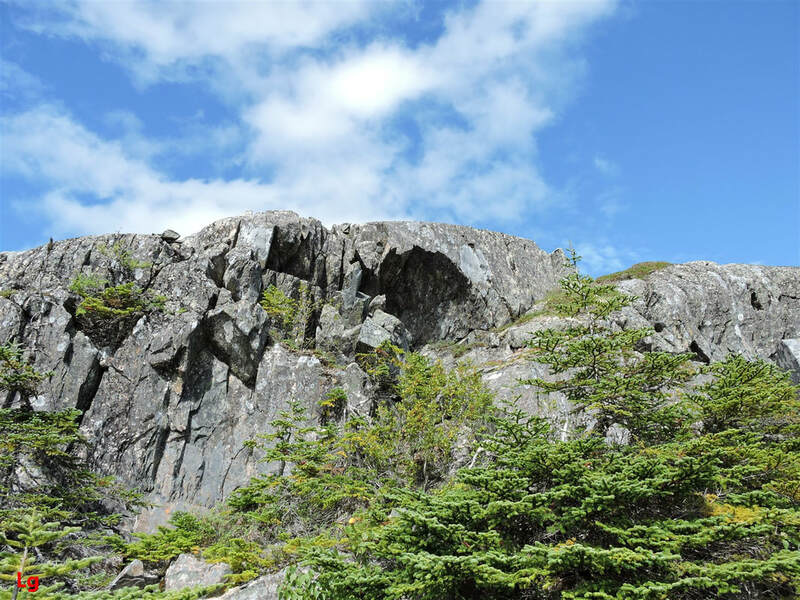 The two tiered bedrock ridge pictured above was smoothed by basal-slip glacial erosion before a second phase of erosion shattered the rock face in the lower tier. Closeup examination of the shattered rock face reveals that bedrock frost heave with rotation was the primary mechanism of rock displacement. 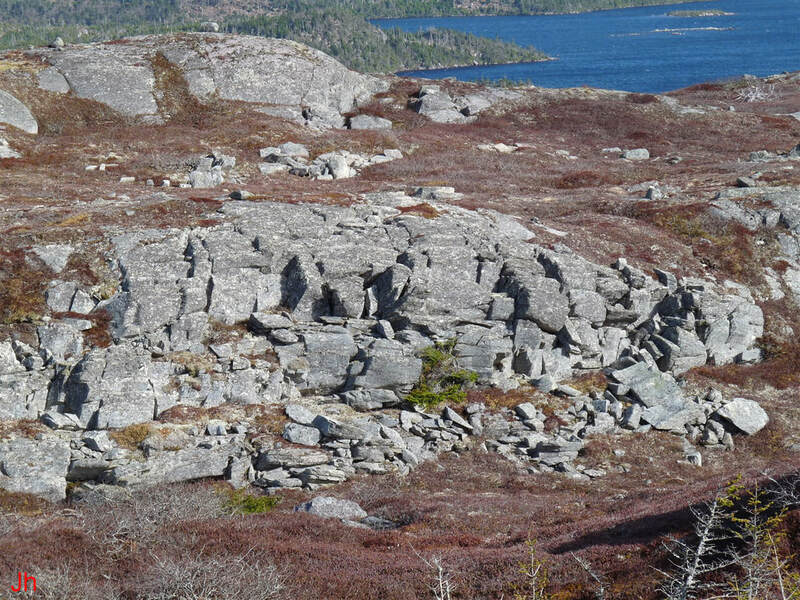 Some broken rock has been shifted a few meters out from the rock face, but, in total, the volume of rock originally present in an initially rounded bedrock contour appears to have been conserved at the site. Before the bedrock disruption occurred on the lower tier of the ridge, the lower tier probably resembled the present appearance of the upper tier. A second view of the previously illustrated disrupted bedrock occurrence is shown above. In this view, the rotation of bedrock fragments is more apparent. Note the elongated narrow blocks wedged between lesser-rotated wider blocks on either side. 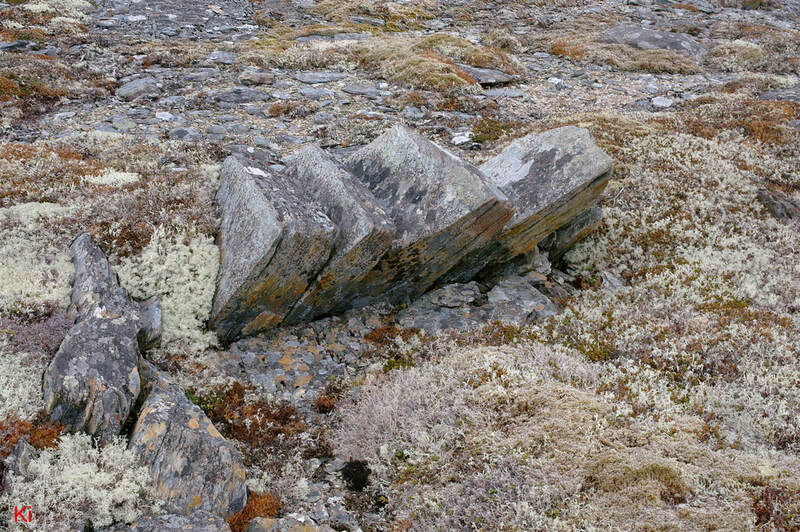 These blocks have been expelled from bedrock substrate and may have settled into their present orientation after ice departed. Note also the large block in the foreground that has been transported outward from the rock face. This block is about a meter long and now rests about 1.5 meters from the position it occupied before frost heave occurred. Two closeup photos, taken from opposite directions, show a more detailed view of the rotated frost-heave blocks on the face of the lower tier of the above-described ridge. The ice flow direction near this location was determined from independent observations at nearby locations. 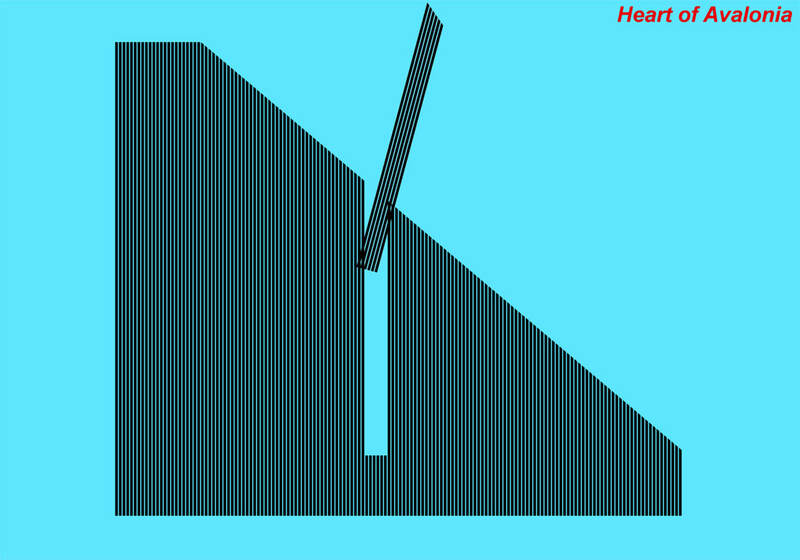 The rotation of the blocks is top-outward in the down-ice direction. Thus, the disrupted bedrock occurrence formed on the lee side of the ridge, as would be expected if it were a glacially-plucked feature. Why is the above-pictured layout not an example of plucking by a warm-based glacier? Aside from the limited scope of total rock movement, the best argument lies in looking at the surrounding topography. 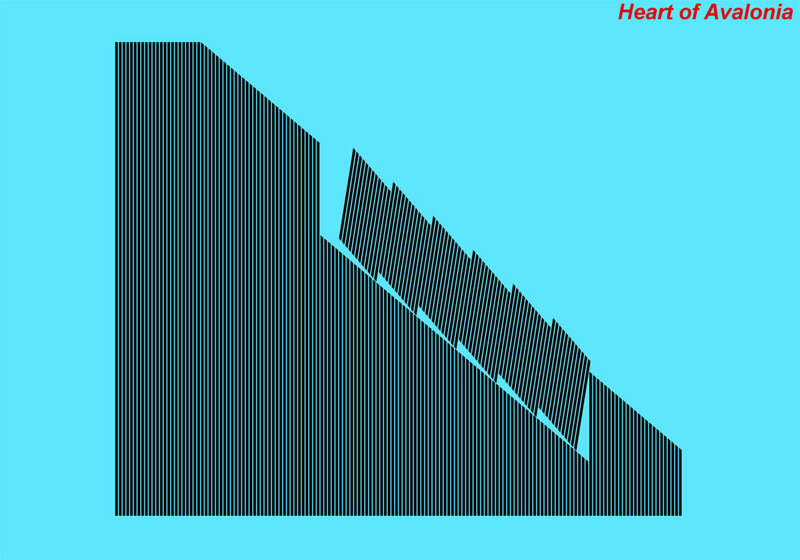 The illustrated (lee) face of the two-tiered ridge forms one side of a narrow valley. Ice moving outward from the ridge must immediately ascend a second ridge significantly higher than the illustrated ridge before moving onward toward the coast (about 4 km distant). This topography would not favor the reduction in ice pressure needed to allow glacial meltwater to refreeze and cause plucking. 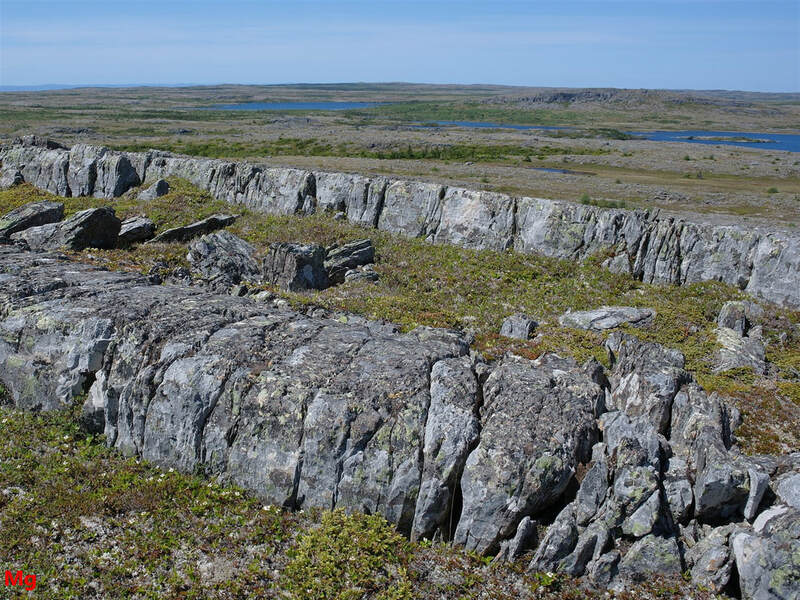 The relative absence of bedrock disruption on the upper tier of the illustrated ridge suggests that groundwater hydrology, rather than a reduction in glacial ice pressure, controlled the location of bedrock disruption. All of the rock visible in the four photos above is similar. The rock is volcanic, mainly ignimbrite and is strongly foliated. 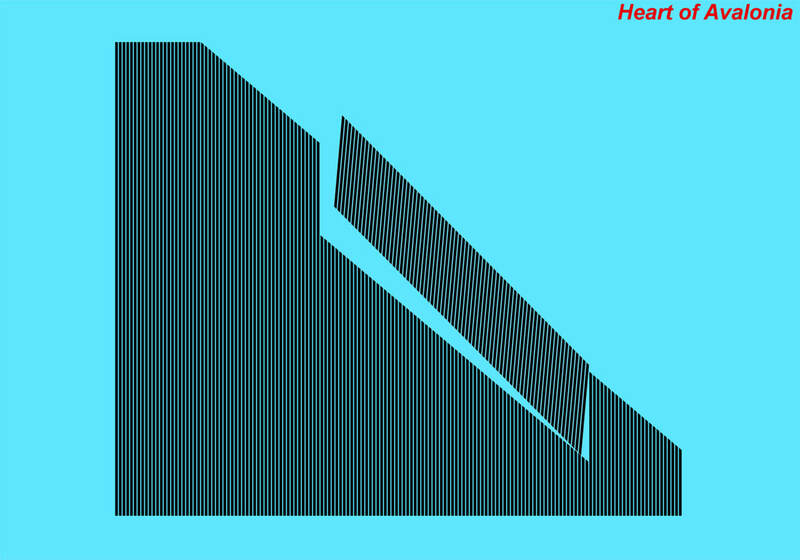 The foliation is of longitudinal tectonic origin and the area is traversed by abundant cross joints at steep angles to the foliation. In continuing the argument against origin by warm-based glacial plucking, two features, nearby to the ice-disrupted bedrock formation illustrated above, are worthy of note. Firstly, a cluster of frost-heaved monoliths lies on the flat section between the two tiers of the ridge and just to the left of the field of view in the first of the above four photos. This cluster is pictured below (photo also appears in the description of Illustrative Feature 02). The tallest frost heave monolith in the cluster shown above is about 1 m tall. 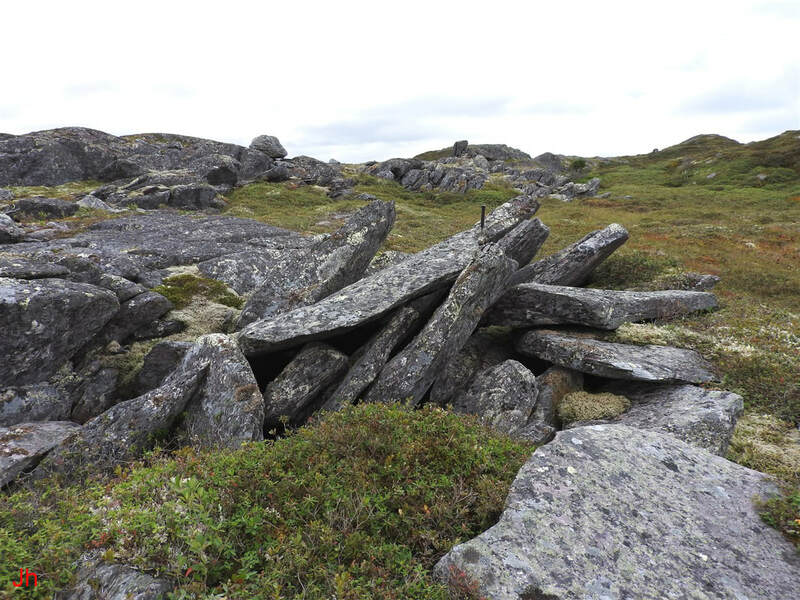 This fragile cluster of slender monoliths could not have survived basal-slip erosion nor could it have survived rapid creep in an overlying glacier. A second nearby item of interest comprises a narrow row of rotated frost-heaved joint blocks on the back (presumed stoss) slope of the two-tiered ridge described above. This small (about 2 m high) formation of rotated blocks leans opposite to the direction of rotation of the ice-shifted blocks shown previously and against the assumed direction of ice flow. It is not possible for plucking to account for both the formation of this secondary group of rotated blocks and the much larger group illustrated previously, unless ice flow direction reversed at some point. A reversal in warm-based ice flow would tend to erode away fragile frost-heave features oriented in opposition to the flow. The feature shown above can be explained by assuming that local groundwater pressure in the bedrock ridge exceeded local glacial ice pressure, notwithstanding the circumstance that glacial ice was ascending the slope when the feature was formed. Overall ice motion would be subdued in a cold-based glacial environment with ground-level tangential ice creep rates approaching zero. If this explanation is valid, then the small feature illustrated above falls within the context of the subglacial ice plume model. 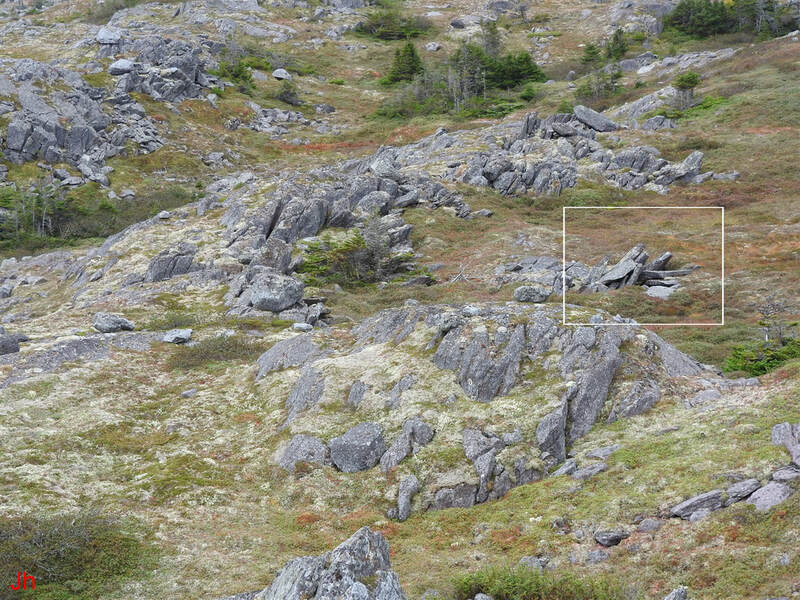 The white box in the above photo highlights a group of frost-heaved bedrock fragments lying about 150 m up-ice (but downhill) from the two-tiered ridge described in the First Example. A low ridge lies just left of the highlighted feature. This ridge has undergone intense disruption via bedrock frost heave. To the right of the highlighted feature, the land rises monotonically toward the top of the two-tiered ridge. A closeup view of the feature highlighted in the preceding photo is shown in the above photo. Note the hammer (27 cm long) standing on the rock above and to the right of center in the frame. The slab of rock visible in the foreground (bottom right of frame) has been completely dislodged from bedrock at this location and transported about 1 meter. Other fully-dislodged fragments are seen in the background, just behind the front-right fragment. In some respects, mainly because of the pronounced rotation of the still-rooted blocks and the lateral transport of the dislodged slabs, this occurrence resembles a glacially plucked feature. However, the topography of the location where the feature occurs would not favor the ice pressure reduction needed to permit warm-based glacial plucking. A second closeup view of the ice-shifted blocks is shown below. 1) Uplift and expulsion of blocks from bedrock via frost heave. 2) Rotation and transport of blocks by tangential motion of overlying glacial ice moving toward the right. A composite flow of ice comprising ice emanating from the ground and low-velocity near-ground tangential glacial ice creep could account for the observed rock displacements. This description points toward adoption of the Subglacial Ice Plume Model to describe the origin of the feature. The two examples given above bolster the basic argument against adopting Model 2 (plucking) as the cause of common occurrences of bedrock frost heave with rotation on sloping surfaces. The fundamental argument remains that the very limited degree of total rock motion in rotated bedrock frost heave formations is incompatible with plucking by a relatively fast-moving warm-based glacier. Model 3 interprets bedrock frost heave with rotation in terms of the direct mechanical action of moving glacial ice on the bedrock underlying a glacier. In theory, the model can apply to bedrock disruption by a warm-based glacier or by a cold-based glacier. While a warm-based glacier will slide on a smooth surface, irregularities in a bedrock surface will force ice to yield in creep or fracture, imparting stress to the underlying rock surface in the process. A cold-based glacier moving by creep will have zero velocity at the ice-bedrock contact. This implies that if the bedrock does not yield so as to follow the creep in the overlying ice, the bedrock will be subjected to deviatoric stress closely matching the deviatoric stress powering creep in the ice closest to the ice-rock contact. The cold-based mode of action for Model 3 is probably more effective than the warm-based mode, particularly for causing disruption of bedrock surfaces that have been previously smoothed by basal-slip glacial erosion and therefore lack significant irregularities. The onset of bedrock disruption of the kind seen on many previously-smoothed sloping surfaces would then serve as an indicator of a transition from warm-based to cold-based ice flow conditions. Alternatively, the onset of bedrock disruption might be triggered by a shift in the glacial stress regime from a hydrostatic regime (no ice flow) to a deviatoric stress regime (ice creep) or to a change in ice flow direction. When foliated bedrock is delaminated by glacial mechanical action as illustrated in the above diagram, the space between the laminations can fill with ice moving by creep and driven by the action of unbalanced hydrostatic pressure. 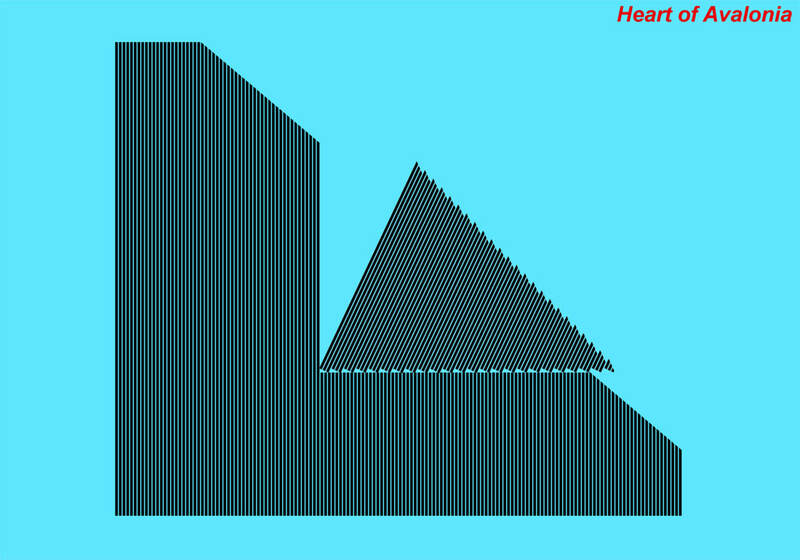 Alternatively, some of the space between the layers may remain empty. Model 3 (Glacial mechanical action) does not entail a phase change (water-ice) and thus does not necessitate transfer of the large amounts of latent heat that accompany a phase change. This model may play a partial role in most instances of bedrock frost heave with rotation and may play a dominant role in allowing large gaps to open between layers of rotated frost-heaved bedrock. There are some specific instances when glacial mechanical action can be excluded as the sole cause of bedrock disruption by ice. For example, glacial mechanical action cannot cause the formation of vertically standing frost-heave monoliths on level or gently sloping ground. The model also cannot completely explain rotated bedrock frost heave on sloping surfaces where some fragments extend out significantly beyond the contour of the original undisrupted rock surface. Finally, the model is unable to account for occurrences of bedrock frost heave with rotation where the directions of rock shifts at nearby locations are inconsistent or in opposition. Such occurrences imply a complex pattern of ice creep near the ground and therefore imply that nontangential ice flow is significant. 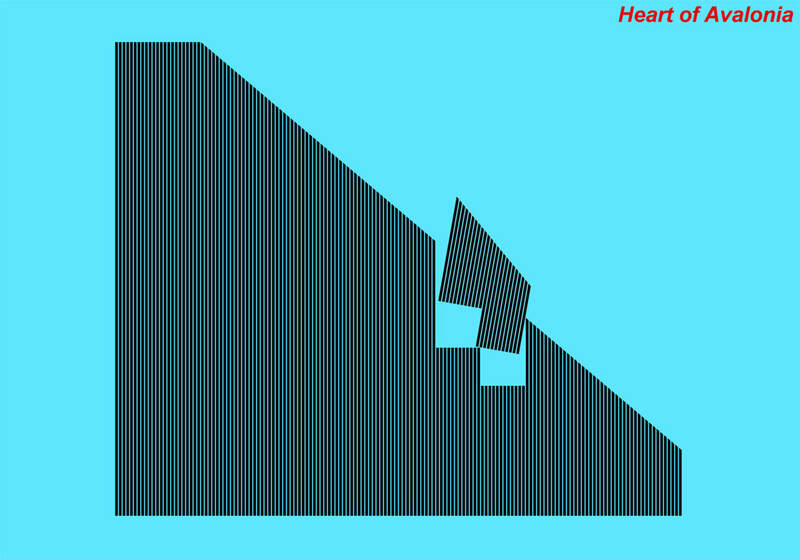 1) Bedrock and an overlying cold glacier are treated as a single entity. 2) Bedrock fragments travel alongside adjacent ice that moves and deforms via creep. 3) Fragments map out ice flow patterns and thereby leave a record of past near-ground ice motion. While the model incorporates significant underlying aspects that lack direct evidence*, the model is able to explain the layout of almost all occurrences of bedrock frost heave observed on the Avalon Peninsula. 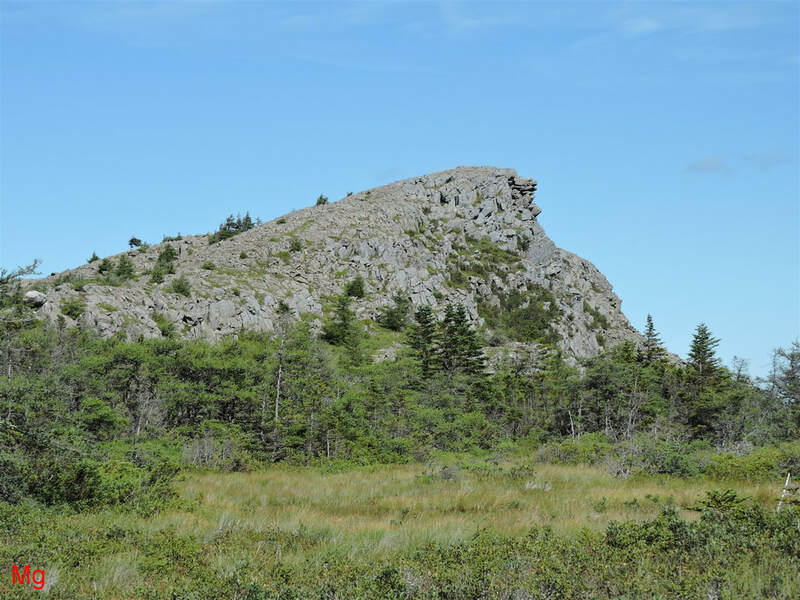 Accepting the Subglacial Ice Plume Model for the interpretation of any specific occurrence of bedrock frost heave will place bounds on recent pre-Holocene glaciation, deglaciation and on the accompanying climate that affected the Avalon Peninsula. The set of sketches presented below lays out some of the geometrical considerations determining the ability of bedrock fragments to shift and rotate from a sloping rock face. For each sketch, it is assumed that longitudinal foliation in the bedrock dips vertically and that cross joints are present at various orientations. Total rock volume is exactly conserved in each drawing, except for small "conflict" areas where lines overlap and rock is assumed to crumble. 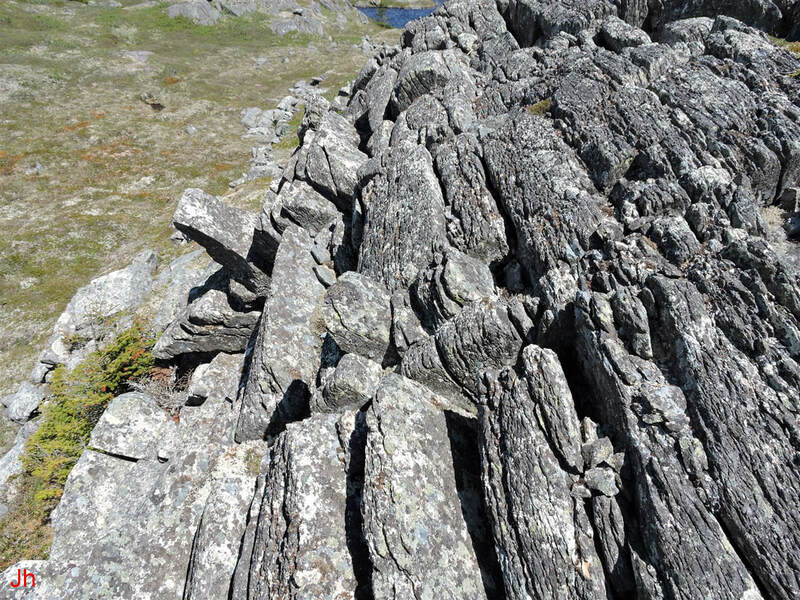 The need for shifted bedrock to find "room" to occupy becomes a key factor in determining whether a given geometry of rock disruption is likely. While ice can deform in creep, bedrock cannot, and bedrock obstructing bedrock is a primary determiner of patterns of rock disruption by ice. A block, unhindered in rotation, rotates and thereby makes room for subsequent block(s) to rotate. Blocks that undergo limited vertical frost heave before rotation can often generate conflicts when rotated. However, the wider the block in comparison to its height, and the higher the block is lifted before rotation, the less the conflict. 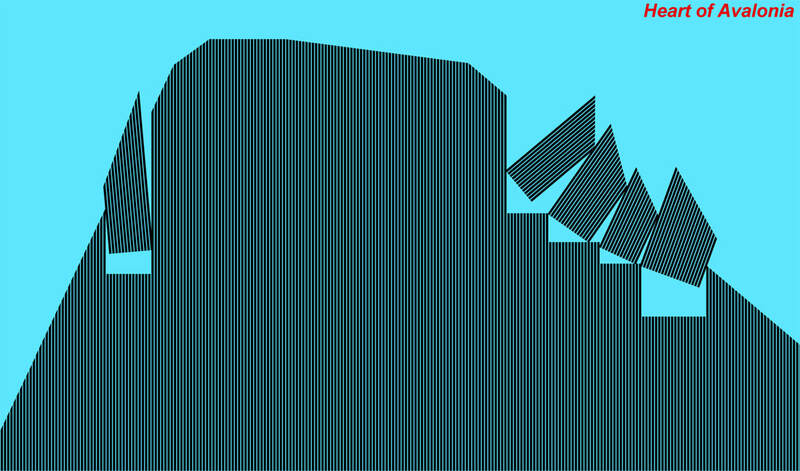 A tall, narrow block generates significant conflict when rotated through even small angles. The arrangement is inherently fragile and unlikely to survive glacial ice loading. Tall, thin rotated frost-heaved bedrock fragments occasionally survive both deglaciation and Holocene weathering. 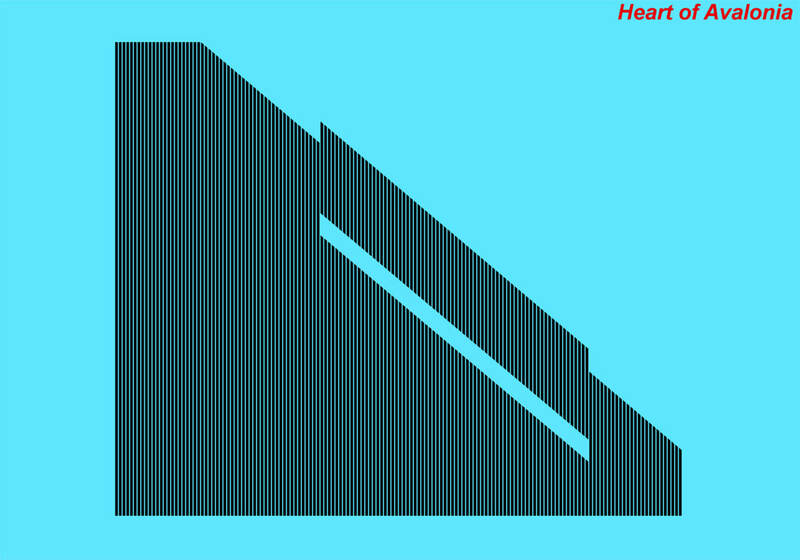 Disruption of rock at the base of the above feature (feature is more than 1 m high) allowed rotation without breakage. Fragile features such as the one illustrated above imply that basal-slip or rapid-creep glacial motion did not occur near the feature after it was formed. A complex, seemingly flow-aligned rotated bedrock frost heave feature is apparent in the background of the above photo. This background occurrence suggested that the hillside was glaciated when the frost heave occurred and that plumes of ice originating from within the hill guided formation of the observed frost-heave features. A sloped or stepped bottom surface on a frost-heaved block can help allow rotation of the block without conflict. Although the lowest block shown in the above sketch was rotated in conflict with adjacent bedrock, all subsequent blocks in the ascending chain are able to rotate unhindered. After a single block is expelled from bedrock completely, multiple blocks behind it are free to rotate through large angles. 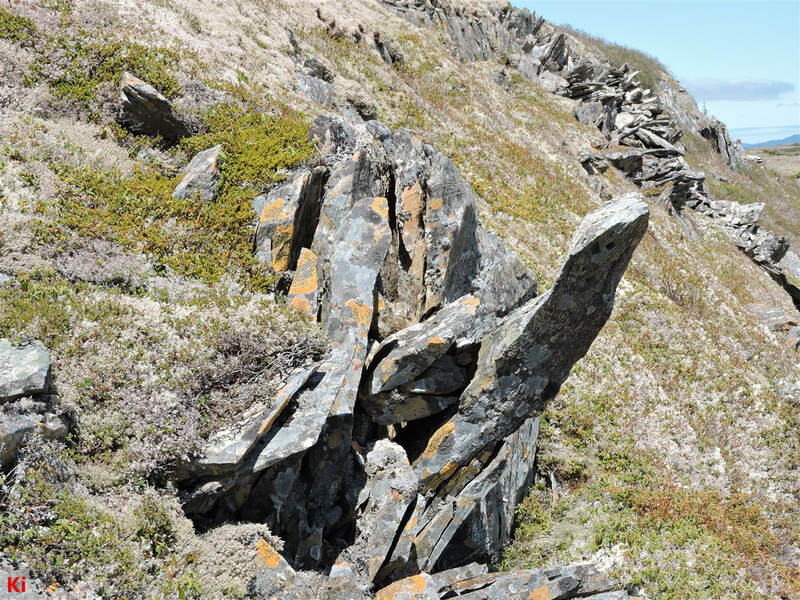 This arrangement is seen at several locations in the field and suggests that the expulsion of a joint block from a slope might serve as a trigger to initiate formation of a multi-tiered rotated frost-heaved bedrock feature. In both of the above sketches, an elongated fragment of bedrock is shown after displacement by bedrock frost heave. The first (left) sketch shows pure vertical translation, while the second (right) sketch shows vertical translation and rotation. These sketches are provided to show contrast with the following sketches where stepped shear deformation of the bedrock fragment provides additional room for ice between the fragment and surrounding undisrupted bedrock. 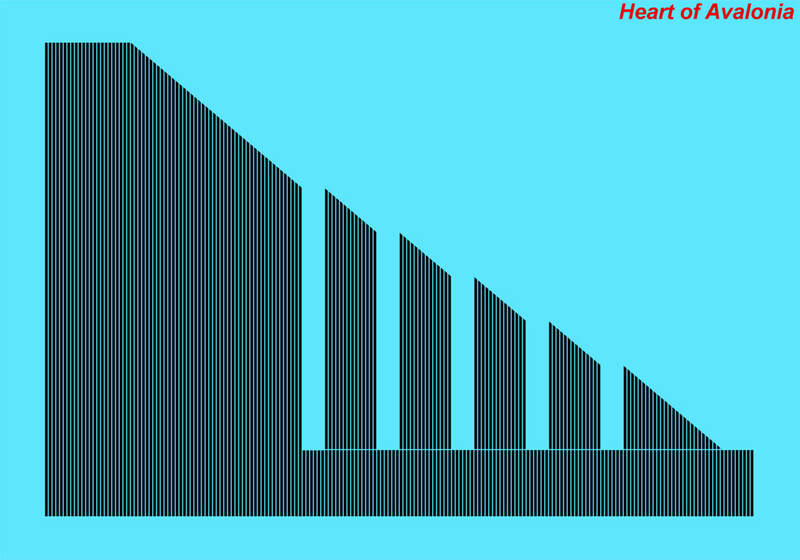 By allowing failure in shear between the blocks, the aspect ratio (length/height) of a stack of blocks is changed to make the stack shorter, but taller. 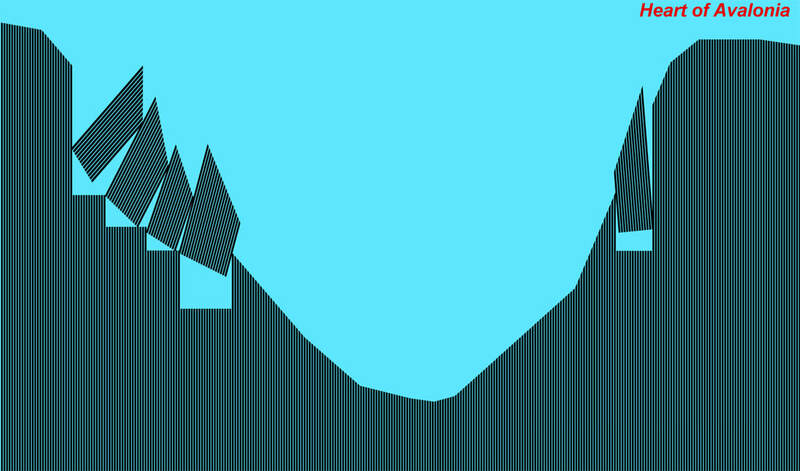 This change permits additional ice to enter the gap at the top of the stack. Note that the individual blocks are rotated, not sheared, and hence the original blocks are not deformed. 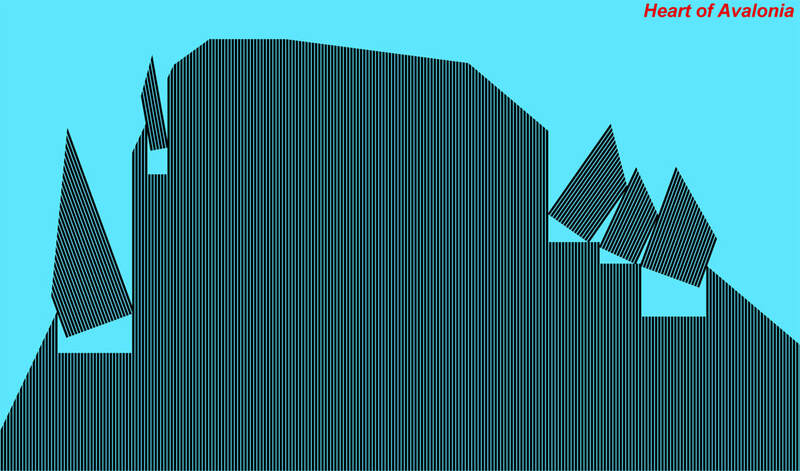 Increasing the angle of rotation (second sketch) reduces the aspect ratio of the stack and creates more room at the top. 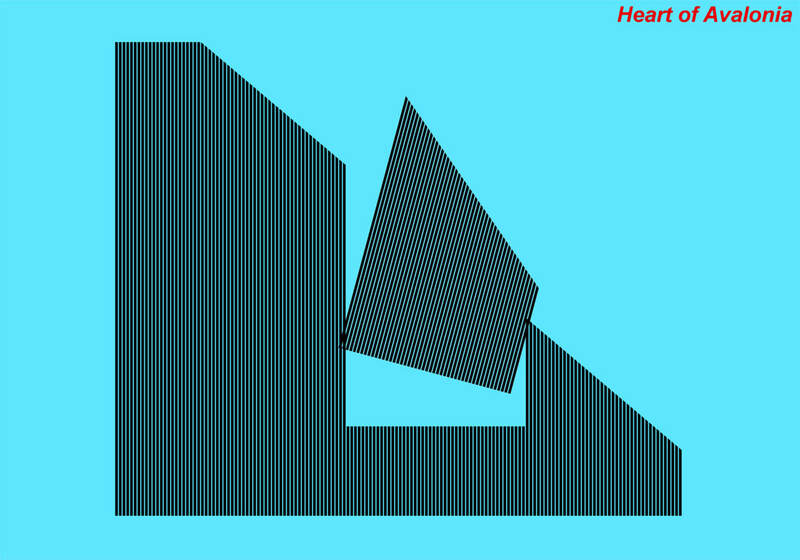 The above two sketches show nearly continuous shear in two blocks with different geometries. In both diagrams, individual thin layers of bedrock are rotated, not sheared, but shear failure occurs frequently between layers. 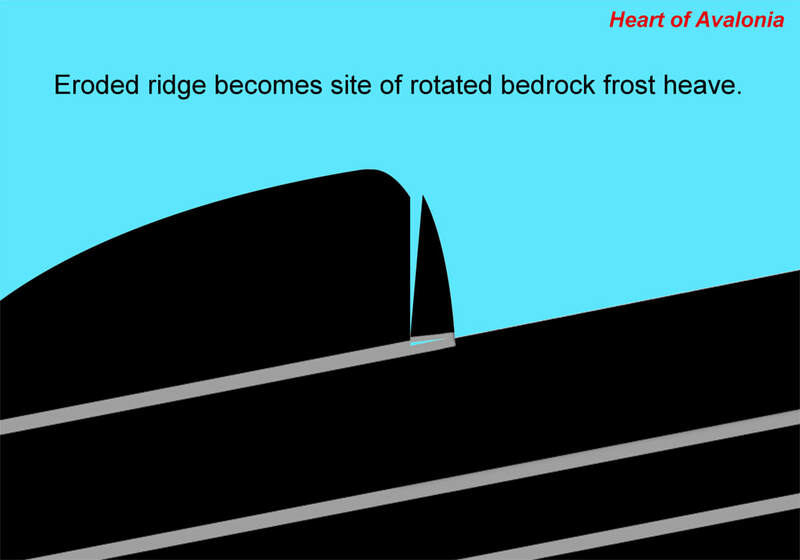 This type of rotation with shear is effective at allowing bedrock to yield to ice-induced stress directed down-slope while little ice enters from below. Without ice entering from below, hydrostatic pressure from overlying glacial ice would hinder development of gaps in the rock beneath the disrupted stack. In the above-illustrated rotated bedrock frost heave feature, note the significant wedge-shaped gap at the top of the stack of displaced blocks. In order to accommodate the observed rotation, the stack appears to have failed internally repeatedly in shear. 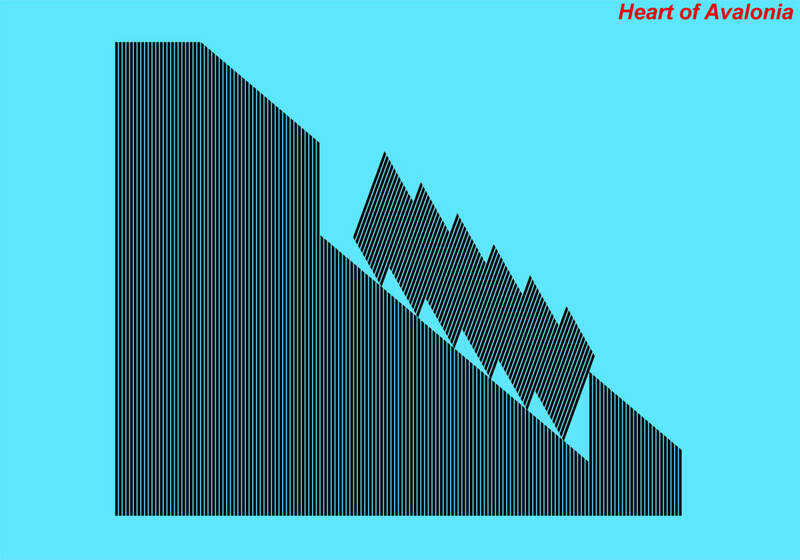 The above two sketches show bedrock frost heave with rotation occurring on both sides of a ridge or hill. This type of two-sided occurrence, where directions of rotation in nearby blocks are in opposition, eliminates plucking or glacial mechanical action as a primary cause of bedrock shift. 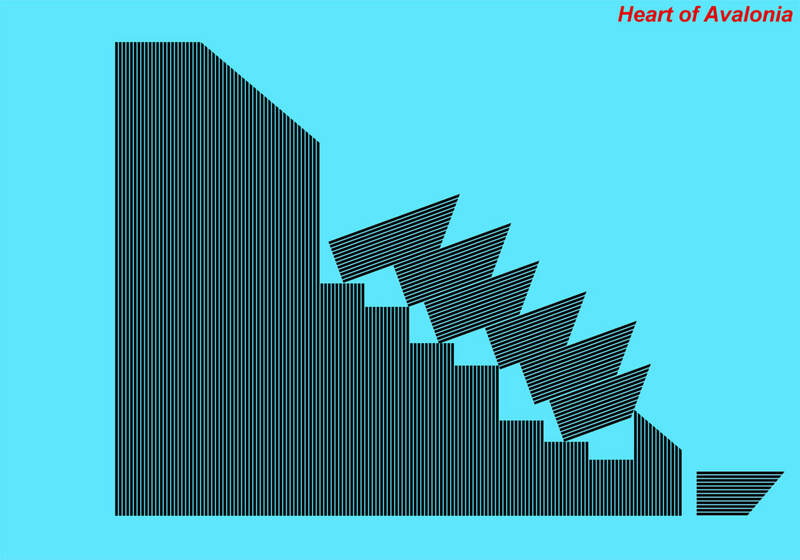 Rather, the blocks are rotated outward from the slope mainly because there was less resistance to shift occurring via top-outward rotation than via any other mode. A significant asymmetry in the severity of rotated bedrock frost heave occurring on one side of a hill or ridge versus the other side (second diagram above, ice flow assumed toward the right) would indicate that glacial ice flow across the hill or ridge could have influenced the bedrock disruption. Asymmetry might imply that the bedrock disruption was augmented by glacial mechanical action on the lee side of the hill, or that glacial ice pressure was lower on the side of the hill showing more severe bedrock disruption. 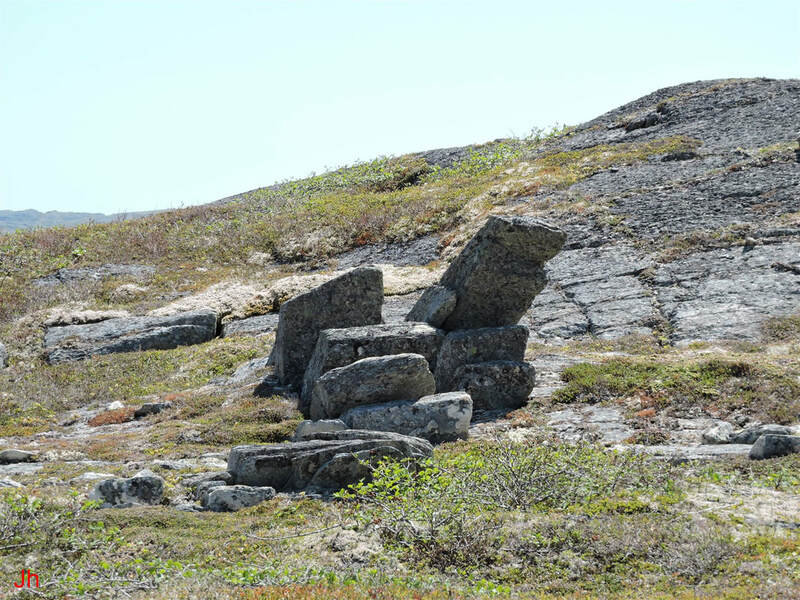 Features with two-sided geometry, as illustrated in the above two sketches, have been observed at several locations on the Avalon Peninsula. These features are considered important because they exclude unidirectional tangential (glacial) ice flow as the sole cause of their formation. Rather, these two-sided features were either formed under subaerial conditions (Model 1, above) or they represent evidence supporting the Subglacial Ice Plume Model (Model 4, above) as their mode of origin. Model 4 is favored over all three competing models (Models 1,2 &3) when a subglacial origin of the features is indicated. A valley with opposing rotated bedrock frost heave features is illustrated in the above sketch. The same considerations that are discussed above in relation to hills and ridges also applies when interpreting two-sided opposing rotated bedrock frost heave features in valleys. 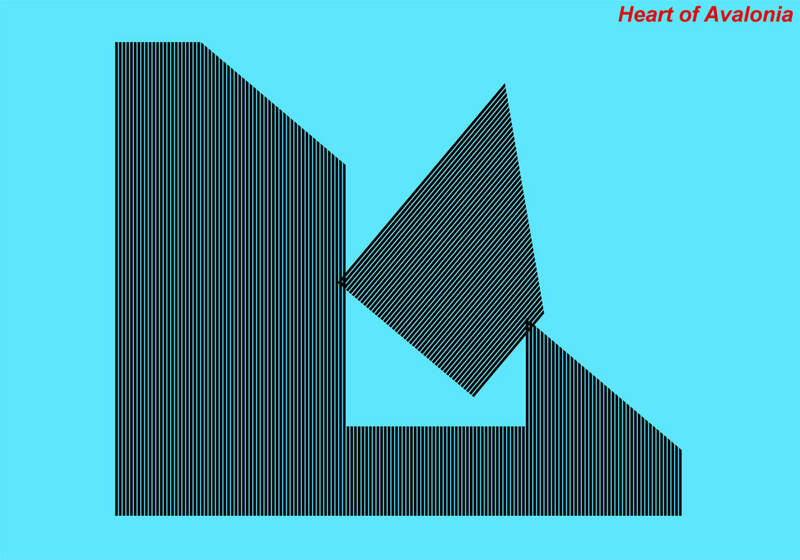 The frost-heave geometry illustrated in the above sketch does not comprise bedrock frost heave with rotation since the blocks are translated horizontally, not rotated. Features with this configuration of bedrock disruption resemble rotated bedrock frost heave and are likely similar in origin. Horizontal translation features and vertical translation features are frequently seen in conjunction with rotated bedrock frost heave features on hillsides.